Functional stupidity in the workplace is best described as when smart people are discouraged to think and reflect at work. The ramifications can ultimately be catastrophic, leading to organisational collapse, financial meltdown and technical disaster. However, there are countless commonplace examples of businesses accepting and encouraging functional stupidity within their organisations; from unsustainable management fads to an over-reliance on brand and image. However, a dose of functional stupidity can be useful and produce good, short-term results: it can nurture harmony, encourage people to get on with the job and drive success. This is what the authors refer to as the stupidity paradox. For over a decade we have been studying knowledge intensive organisations. These have included management consultancies, banks, engineering firms, pharmaceutical companies, universities and schools. We spoke with hundreds of people in dozens of organisations. During the course of our research, we were constantly struck by how these organisations, which employ so many people with high IQs and impressive qualifications, could do so many stupid things. Our investigations into the stupidity paradox revealed many examples of when sensible decisions are ignored. Executives who more interested in impressive power point shows than systematic analysis. Companies ran leadership development initiatives which would not be out of place in a new age commune. Technology firms that were more interest in keeping a positive tone than addressing real problems. Schools focused more on developing impressive strategies than educating students. Marketing executives who were obsessed with branding when all that counted was the price. Senior defence officials who were more interested in running rebranding operations rather than military operations. We started to ask why such smart firms with intelligent people could do such stupid things. We found that these organisations would often hire smart people and then encourage them not to use their intelligence. The smart people would naturally try to think for themselves and ask questions. But this was discouraged in subtle and not so subtle ways. Employees were told things like 'don't think about it, just do it', and 'don't bring us problems, just bring us solutions'. The smart workers quickly learned not to ask too many questions or to think too deeply because fully using their intelligence would result in awkward questions that might upset their superiors as well as their co-workers. The easiest course of action was often just to get on with the job. We came across many processes that stupefy people at work such as leaders who encourage their followers not to think too much. Other examples include policies and processes which are mindlessly followed; corporate window dressings that were more about symbolism rather than substance; companies thoughtlessly imitating others firms, and corporate cultures that trap employees in mental straitjackets. Generally, it is normal to think stupidity at work is a problem, but we were surprised to find that sometimes it can be useful (hence ‘paradox’ in the title), at least in the short-term. The benefits of people not fully using their intellect has operational benefits, from decreasing time-wasting from asking too many questions, to avoiding conflict. This means those who buy-in to the stupidity paradox can get on with the job at hand and make their way up the corporate ladder. However, this kind of stupidity in the workplace can create problems in the long-term. For example, when people overlook problems. Sometimes this didn't matter, especially if the organisation in question was large enough where issues might go unnoticed or be hidden. But when these problems build-up it can lead to disaster. This is what happened in the banking industry in the lead up to the financial crisis. We have also seen happen to Nokia when it was unable to keep up with Apple’s iPhone. There are also examples in many public services, which continue to add pointless policies and procedures rather than actually delivering services to the public. Functional stupidity is deeply engrained in many organisations, and rooting it out is tough because it often has a payoff. But there are some steps firms can take. Organisations can encourage an environment of reflection by building ‘challenge’ into thought processes. One way to do this could be to appoint a ‘devil’s advocate’ whose job it is come up with questions, not solutions. Companies can also encourage greater realism, by getting employees to conduct pre-mortems before a project begins. Finally, organisations can harness theirs employees’ scepticism to get rid of pointless initiatives; for instance, identifying and disposing of empty management speak, which wastes people’s time and achieves little. 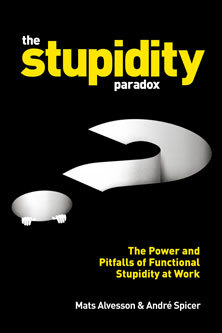 The Stupidity Paradox: The Power and Pitfalls of Functional Stupidity at Work (Profile Books), by Mats Alvesson and André Spicer. André Spicer is Professor of Organisational Behaviour at Cass Business School, City University London. Mats Alvesson is Professor of Business Administration at Lund University and a Visiting Professor at Cass Business School.